US Duct, a manufacturer of industrial ducts and industrial ductwork solutions, focuses on delivering quality products quickly and at the best price. We Make Selling Industrial Ductwork Easy for you, with our FREE 3D ductwork design and quoting software, DuctQuote.com, on-time delivery, personalized service and all of this at a great price! If you are like us then you are tired of empty promises about quality, delivery, service and price and you are looking for someone that takes ownership. At US Duct, each employee has a mindset of personal ownership. When you talk to a person at US Duct, you are talking to someone that has made the commitment to make sure we set legitimate expectations for you and then work hard to EXCEED them! No other duct manufacturer understands more about putting a working duct system together, tailoring it to the customers current and future needs, communicating how to install it, then manufacturing it correctly and delivering it on time. We have worked in and with the industry for years and we know how to make it all work for you. These are the words we live by and the words that will serve you. But what do they mean? Quality - Our product will be EXACTLY as promised or we will ship you another one the next day and credit the part to your bill. Delivery - If it is our fault that it delivers late, the freight is free! Design - We will design it for you and consult with you on the design - BEFORE YOU BUY and with no obligation to us. Service - We treat you like we want to be treated. Price - We want your business and will give you the best price to get it - PERIOD. Yes, we make it ALL - industrial ducting parts and accessories. Delivered on time at the best price. Pipe and fittings made in any connection style. Clamp together, Flanged, Airtight Clamp-Connect Tubing or Weldable ends. Through sheet metal fabrication skills and seasoned duct systems consulting, US Duct, has worked with contractors, reps, fortune 500 companies and small one man wood shops for decades and we understand the problems that they encounter. We have also learned from these customers as they have discoverd unique solutions. 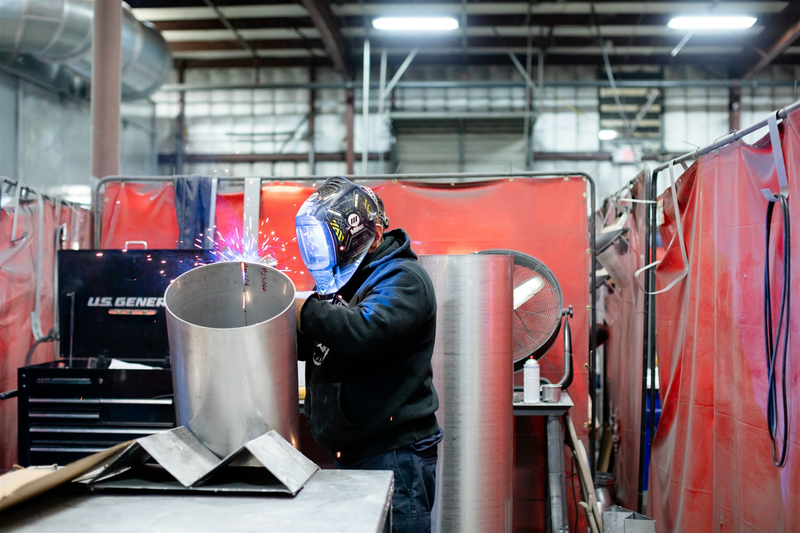 US Duct is dedicated to using that knowledge and our fabrication capabilities to providing SOLUTIONS - before you know you need them. If you can draw it - WE CAN BUILD IT. It is just that simple. We have a fully equipped, 34,000 square ft. shop. Think of US Duct as YOUR personal sheet metal fabrication shop. We work for you!